Hilo-based wedding photographer James Rubio started Big Island Grinds in July 2005. 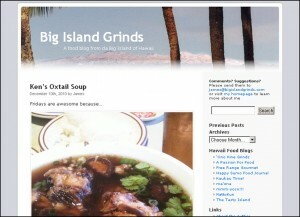 Inspired in part by Reid of Ono Kine Grindz, James’ first post to his “flog” (food log) reviewed the loco moco and onion rings at Blane’s Drive Inn. You can follow James on Twitter at @rubio.